His influence with Trump is subtle and alarming. A portrait of Andrew Jackson (his hero) was put up in the Oval Office the day he slithered into his new position as Trump's chief adviser. His careful grooming of Rump included planting the idea that Rump was like Andrew Jackson, a pugilistic populist president who campaigned against elites and was know as temperamental and rash. As much as the disruptive Frump likes the idea of outraging elites it's not working out too well. His slash-and-burn style has been on steroids supplied by Steve Bannon. 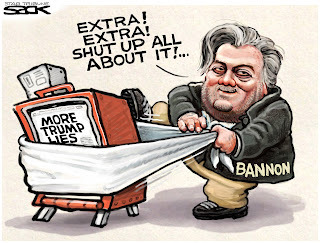 As the second most powerful man in the new regime, Stevie the White Supremacist has been given an opportunity to realize his ultimate goal: to completely destroy the establishment and rebuild it to suit his ideology. From the start he made his mark by drafting the dark Inaugural Address and imposing the refugee ban. Meanwhile Bannon proceeded to minimalism the national-security team by negotiating a permanent place for himself on the National Security Council. Each step Bannon takes to insure his control of the government is another freedom, or law, suppressed. Trump is in the game for power and the ultimate massaging of his runaway ego. 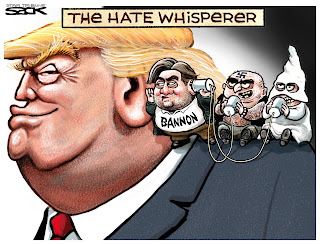 Bully Boy Bannon is well on his way to realizing his dream. The chaos (a Bannon hallmark) in the West Wing is starting to become uncomfortable for Donny Little-Hands who wants everyone to adore him. According to senior Administration officials, Lump hauled in a half-dozen of his key advisers and gave them hell for all the confusion caused by his immigration ban. Apparently Chump realized Bannon's implementation of the Ban was a bit too hasty because he made it clear that everything goes through his chief of staff Reince Pribus (who wasn't informed of the ban until the last moment) from here on out. Don't think Rump still doesn't agree with Bad Boy Bannon's goal of tearing down the establishment - he just wanted him to be more careful. So far, Bannon is winning. His influence on making Bump the Disruptor-in-Chief cannot be ignored. 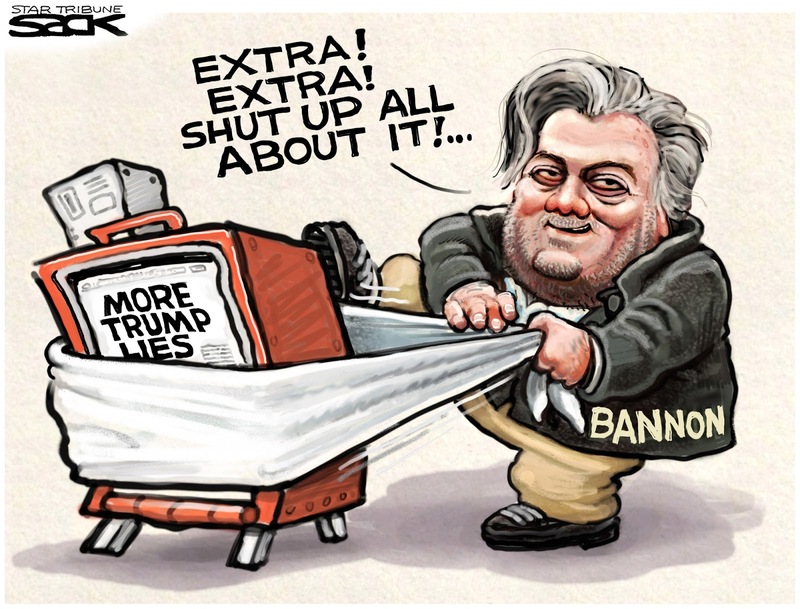 Unless someone in Frump's inner circle manages to neutralize Bannon, we're in for a rockier road than we ever suspected!